Researchers are envisioning a brave new world in which functional 3D-printed organs can be manufactured for implantation in patients – provided several tough obstacles can be overcome. Bioprinting is a growing field in medicine that has scientists well on their way to replicating human organs. But engineering true to life vascular networks has always been a challenge. Bioprinting, or the process of creating human tissues through 3D printers, has come a long way since bioengineers replaced ink with living cells. Researchers at Saga University have developed the method which makes 3D printing of human blood vessel is now a reality! 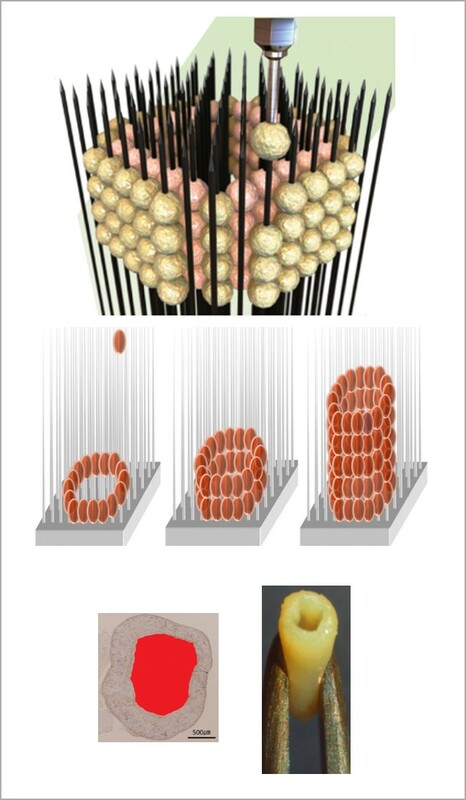 3D bioprinting concept – Cyfuse Medical’s Kenzan Method, a unique form of bioprinting which, rather than use a bio-ink to keep cells in place, uses tiny vertical spikes on which cell clusters (spheroids) are skewered and kept in position, column by column. How does Kenzan Method work? Cellular aggregates called spheroids are cultured, with several tens of thousands of cells per spheroid. With appropriate alignment of needles to form the needle array, cellular spheroids can be positioned in any desired three-dimensional layout. 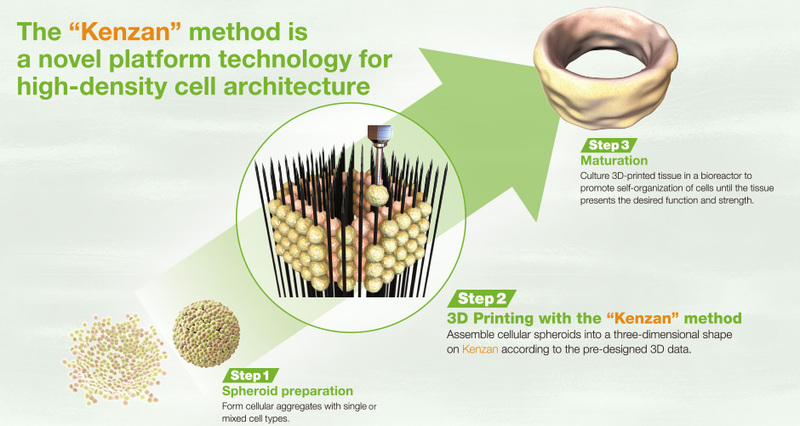 Finally, culturing connected cellular spheroids in a bioreactor promotes self-organization of cells and yields a 3D tissue with the desired function and quality. Advanced tissue-engineering services are available using a new three-dimensional bioprinting approach called the “Kenzan Method”. 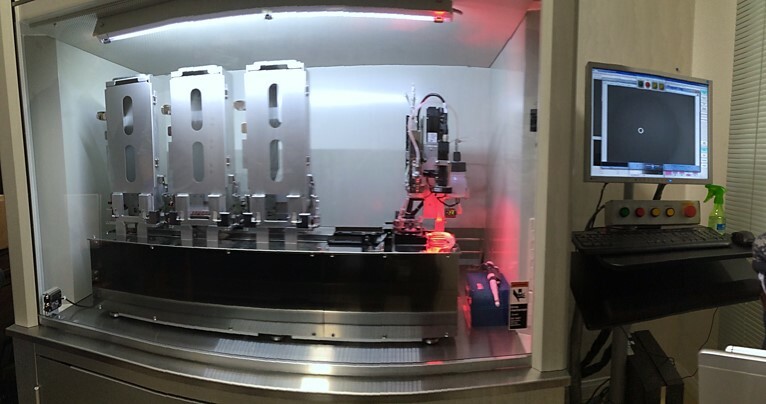 Utilizing Cyfuse Biomedical’s Regenova 3D Bio Printer, a robotic system that fabricates three-dimensional tissue from primary cells, Cell Applications has created a powerful bio-printing model that makes scaffold-free, primary cell-based tissue available. The Method is a gentler approach and increases the percentage of viable cells. The method has already been utilized or assessed to create blood vessels, nerve and functional liver-like tissues. Other anticipated applications include cardiac muscle and pancreatic islets, as well as spinal cord, urologic, trachea, skin and digestive tissues.